Frontline Plus for dogs is waterproof and won't wash off during baths or the rain. The active ingredient in is stored in the oil glands in your dog or cat's skin. 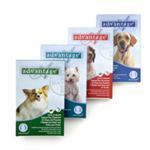 It is then emitted onto the cats or dogs fur, Frontline Plus remains waterproof for 30 days or more. Frontline Plus is so gentle it is approved for use on puppies as young as 8-weeks old. Frontline Plus is also approved for breeding, pregnant, and lactating dogs. 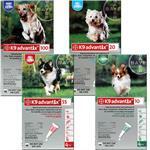 Apply Frontline Plus monthly to provide your dog with non-stop protection against fleas and ticks. Each box contains a 3-month supply.